Warm the milk in the microwave until it feels pleasantly warm (think hot tub, not coffee), then add in the yeast and brown sugar. Wait at least 3 minutes. A froth should begin to form on top of the milk — this tells you the yeast are happy! Add in 2 cups of flour and the butter, mixing it in. 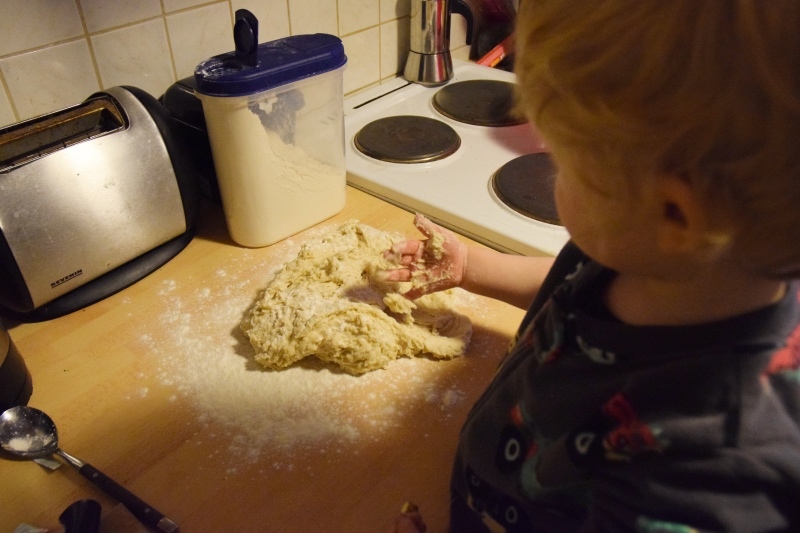 Then start adding the remaining 2.5 cups of flour, iteratively mixing it in and adding more. This may require you to eventually spread out the dough on the countertop and sprinkle the remaining flour… and you may even need more. It should end up feeling firm and no longer be sticking to your hands. 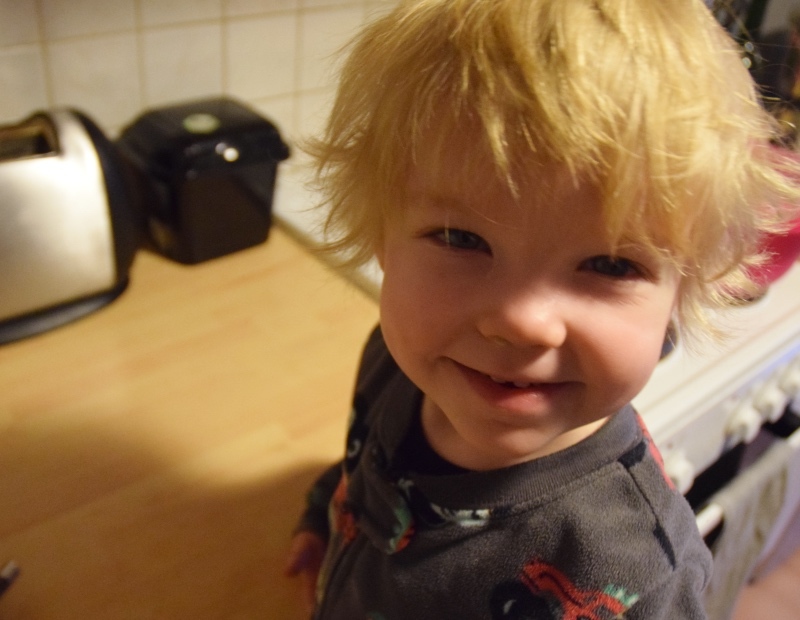 The picture below shows that we still have a ways to go adding in flour. Once it is set, put it back into a bowl, cover it with a moistened towel, and wait about an hour. This provides the pretzels with enough time to rise. After that hour of waiting, your kids will want to do something, so let them punch it down and start forming shapes. Any shape works, but pay attention to thickness. A tennis ball sized piece won’t bake nearly the same as a pretzel rod the thickness of a hot dog. On the stove, bring 5 cups of water to a boil in a medium sized pot (large enough to fit about 3 pretzels in), and then add in the 3 tablespoons [6 TBL in Europe] of baking soda. It will start to foam — that is good. Ever wonder what gives pretzels that soft gooey outside… well here we go. Lower your pretzel shapes into the boiling water, making sure that they don’t immediately sink to the bottom. If they do, scrape them off with a spatula, but they should want to float in the foaming water. Put 2 or 3 in at a time, and give them about 30 seconds of bubbling. Then, with the spatula, submerge the pretzel under the water level to rinse them off, then lift them out and put them on a piece of baking paper. Not dunking them before you pull them out will leave you with great pretzels with a not-so-great baking soda aftertaste. While they are still damp, add coarse salt or sesame seeds. Bake at 400ºF (210ºC) for 10-12 minutes, until the tops start to brown. 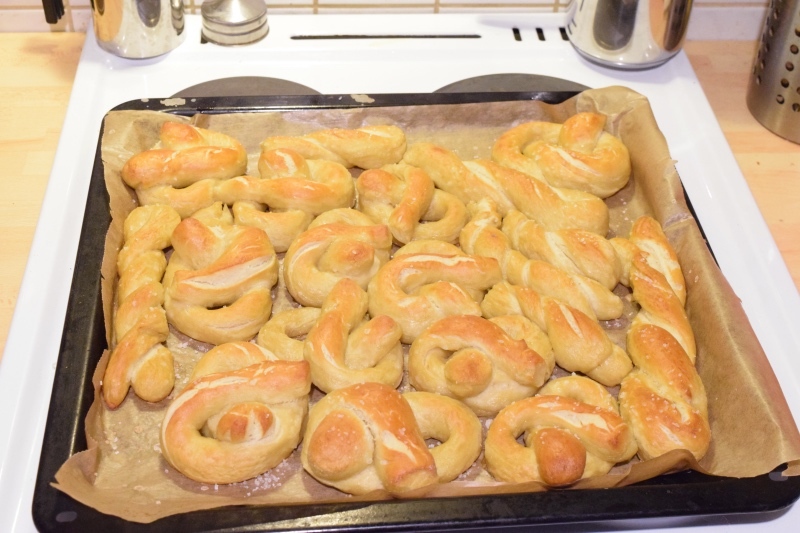 Alterations….doing half whole wheat flour seems to work but the pretzels end up a little less moist. 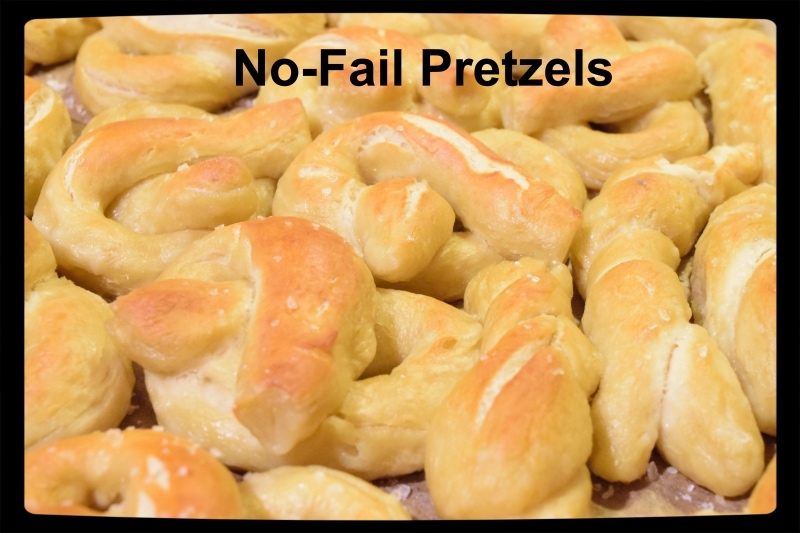 My wife is now gluten-free, so we haven’t been making these as much, but maybe there is an approach that doesn’t require me to make pretzels out of cauliflower? Tagged $, fun 2/5, nature 1/5, time 1h. Bookmark the permalink.